Video clip synopsis – From violent cop killer to a champion of the working class, bushranger Ned Kelly is a solid gold Australian icon and folk hero. Broadband MP4 nedkelly_bb.mp4 (17.7MB), suitable for iPods and computer downloads. 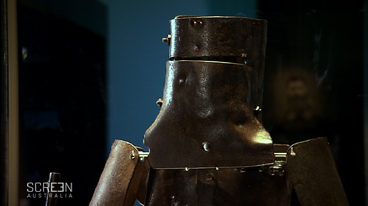 Ned Kelly’s Armour is an episode from the series Australia’s Heritage – National Treasures with Chris Taylor, produced in 2009. Perhaps the best example of bushrangers who transcend the simplistic rural criminal definition is the Kelly gang who were at large in the North Eastern Victoria from October 1878 to June 1880. The terms ‘Kelly Country’ and ‘North Eastern Victoria’ have been seen as synonyms. Although the 1862 Land Act in Victoria offered poorer people the right to select land, in principle squatters were able to control settlement patterns through freehold purchase of land (alienating water resources), dummying and peacocking. The majority of the North East’s selectors found that selection was not as easy as the politician’s believed. British farming techniques applied to poor soils on small acreages were destined to fail. Stock theft, a major problem in the region, brought the selectors into conflict with the squatters, who formed an alliance with the police force. The Kelly gang’s members were young, single men from the region’s rural districts, held together by the prestige of their leader Edward (Ned) Kelly. The members were also for the most-part close family members. The Kelly brothers were part of the Quinn clan, a large Irish-Australian group of families, regarded as the region’s major criminal element by the police. An alternative explanation for the ‘Kelly Outbreak’, believed by many in the region, was that the Quinn and Kelly families had been victims of unnecessary police harassment that had become persecution, resulting in heavy-handed police attention and the ‘murders’ at Stringybark Creek in 1878. During the ‘Outbreak’, Ned Kelly’s quest for personal justice remained dominant. The gang remained at large for 20 months, due to the protection offered by sympathetic selectors, and by June 1880, in rural districts at least, Ned Kelly had become a legend and was seen as a champion of the underdog. Where is Ned Kelly’s suit of armour to be found today? Explain the disadvantages of Kelly’s armour, and how these may have contributed to his capture. Explain why so many citizens of Victoria signed a petition against Kelly’s death sentence. In pairs carry out research and write an informative history of the various relationships between the selectors (small, poor landowners), squatters (large and comparatively wealthy station owners) and the police in north-eastern Victoria, which led to the existence in the area of ‘criminals’ such as the Kelly gang. Include a response to the question as to whether this relationship worsened or improved after Kelly was executed.